NIU President John G. Peters offered these comments Monday, Feb. 14, 2011, at the Presentation of the Memorial Wreaths. 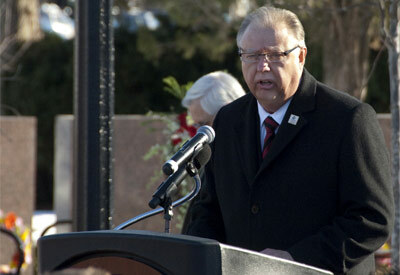 NIU President John G. Peters speaks Monday, Feb. 14, at the Presentation of the Memorial Wreaths. Thank you, family, friends and neighbors of Northern Illinois University for gathering today at this memorial garden, for a moment of reflection and meditation. As you can see, the rejuvenation of Cole Hall began last month. We are grateful to the State for making a financial commitment to this project and helping our community move forward. This fall the building will reopen with a new face and a new purpose. Even though these changes and improvements will not erase our painful memories, I am hopeful they will bring a sense of renewal and reflect our resolve to move forward. It has now been three years since February 14, 2008. We continue to remember those we lost. Catalina, Gayle, Julianna, Ryanne and Dan … our message to you is we have not forgotten, your spirits continue to carry on and you are reflected all around this garden. Last year, we dedicated this special memorial, and over the past twelve months, this place has been visited countless times by so many. Some came alone, others came with friends. Some came to cry, others came to quietly reflect. Some came and stayed for an hour, others just a brief passing moment. Some personally knew those lost, others just knew of them. In coming here, each honored the memory of Catalina, Gayle, Julianna, Ryanne, and Dan. Five lives full of love, optimism, tireless motivation, compassion, and adventure. Five lives that will always be a part of this community and the NIU family. Catalina Garcia from Cicero was a star among stars, always had a smile on her face, and the princess in pink. Cathy, as she was called by her family and friends, mastered the art of living and always succeeded in entertaining her family. Creative, artistic, jovial, imaginative, and an eternal optimist; she lived her life to the full and brought out the best in others through a smile and twinkle in her eye. Gayle Dubowski from Carol Stream was very passionate about her faith, asked intelligent questions, made smart observations, loved to sing and read, and was always doing something for someone else. And, when it snowed, she always had a good time. I imagine she would have even loved our most recent record snowfall. You would have found her making snow angels and actually enjoying the five foot drifts. Julianna Gehant from Mendota loved children, country music and ballroom dancing. She was a veteran and served her country for 12 years in the Army earning the rank of Sergeant First Class. A ray of sunshine able to light up any room she walked into to, she was fun to be around for friends and strangers alike. She went above and beyond in all she did and eagerly pursued her dream of becoming a teacher. Ryanne Mace from Carpentersville helped and comforted people in both words and actions. She was funny, smart, level-headed, outgoing and friendly. An avid reader and intellectually engaging, she loved learning and truly enjoyed her academic experience at NIU. She was highly motivated in her studies and pursuing a career in counseling. She would have made an excellent counselor and transformed countless lives. Daniel Parmenter from Westchester loved sports—football, rugby, softball, and especially skiing. He was a gentle giant standing 6-foot-5 but never intimidating, always smiling, always a joy to be around. Those that worked with him looked forward to their shifts together. You could count on him; he was honest and had a strong work ethic. He was curious and loved to learn new and different things. Today, I believe their message to us is one of pride. Proud we are still moving forward. Proud we are united. Proud we are courageous. Proud we are not letting tragedy define us. Proud we are emulating their lives by illuminating the darkness with light. And so, friends, as we gather here to reflect and remember, NIU moves forward. As the seasons change, as the years pass by, as each new generation of Huskies come and go, it is Catalina, Gayle, Julianna, Ryanne and Dan that remain — for it is their accomplishments, courage, spirit and pride that are the real permanent memorial to what happened on this campus on February 14, 2008.